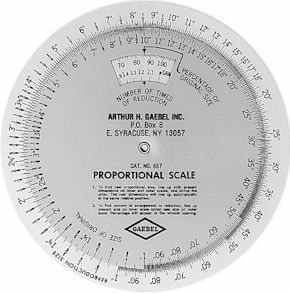 This 5 1/2" diameter vinyl proportion scale is designed to quickly ascertain new reproduction sizes for original art, copy, or photographs. It gives number of times of enlargement or percentage of reduction and shows the new size of any element or area of an original when the whole original is reproduced to a new size. Measurements under 1" are marked in red for slides and other small scale work. This item is available for imprinting - contact us for details and pricing. The price of the 657 is $4.95. 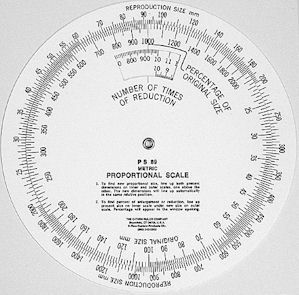 This 8" white vinyl proportion scale is a large version of the model 657. The price of the 857 is $6.95. 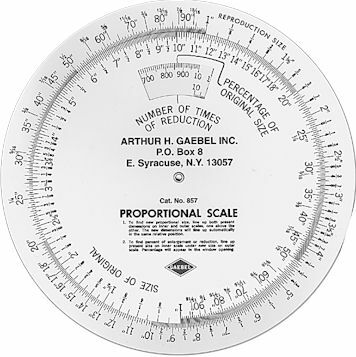 This 15 cm diameter (about 6") metric proportion scale is used to calculate the percentage of reduction or the number of times enlargement for photographs, artwork, and layouts. Made of white, laminated vinyl. The price of the PS89 is $5.00.